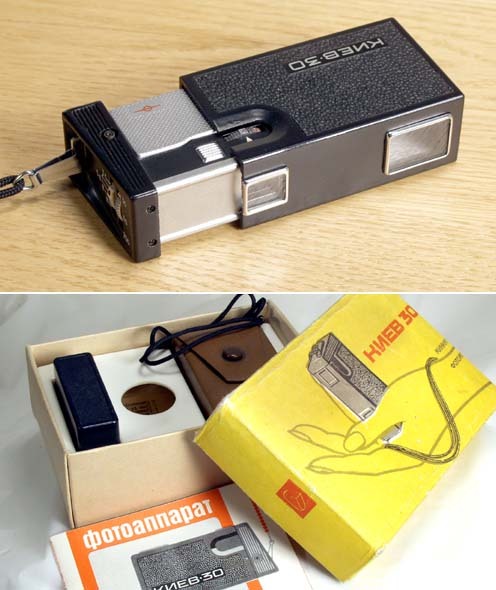 In 1960 Arsenal factory in Kiev, Ukraine decided to add a 16 mm still camera to their well known 35 mm Kievs (Contax copies) and medium format Salyuts (Hasselblad copies). This time is was Minolta-16, which served as a prototype. The original 16 mm line included Kiev-Vega (1960-1961) and Kiev-Vega 2 (1961-1964). Then, in 1974 this model returned as a new and improved Kiev-30. I've seen eBay ads calling this camera a KGB or a spy camera. Well, the KGB and the spies did better than this. The 16mm Kievs were nice small cameras, but not as advanced as the real KGB equipment - F-21. This Kiev-30 was made in 1980. It is in exc. condition, clean and working. Kiev-30 16 mm camera with a strap . You can find useful information on my web site www.fedka.com. Please bookmark the site and check it periodically - it is being constantly updated. Any comments, links and suggestions are appreciated.